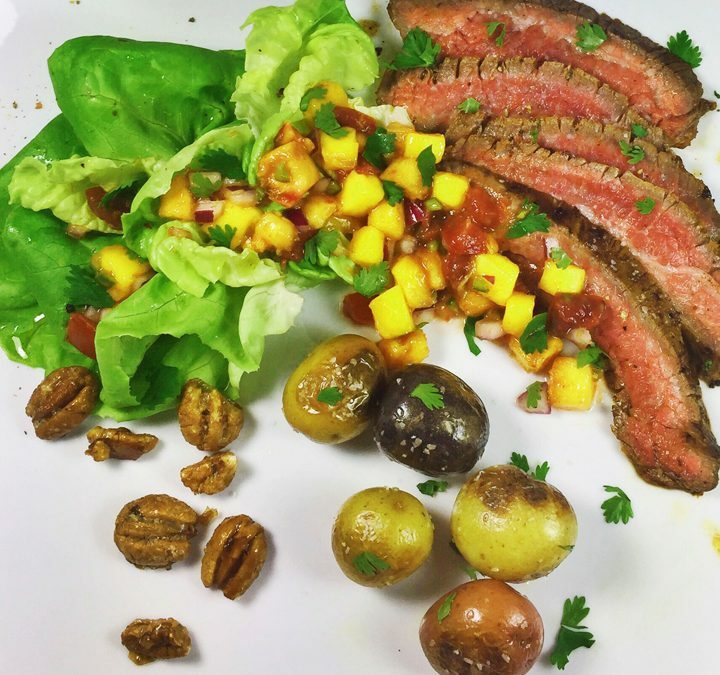 Perfect for your Labor Day Celebration, our Grilled Flank Steak & Baby Potatoes with Mango Peach Salsa, Cherrywood Smoked Bibb Lettuce, and Candied Bourbon Pecans will make you the king or queen of the grill. Most of the components in this recipe can be made ahead, leaving just the grilling and smoking for Labor Day. If you don’t have a method for smoking the lettuce, you can simply skip that step in the recipe. We used Bourbon Barrel Foods Bourbon Smoked Sugar for the pecans. You can find it at some local groceries or purchase at www.bourbonbarrelfoods.com. You can substitute with plain white sugar, but the pecans will be missing a smoky bourbon flavor. 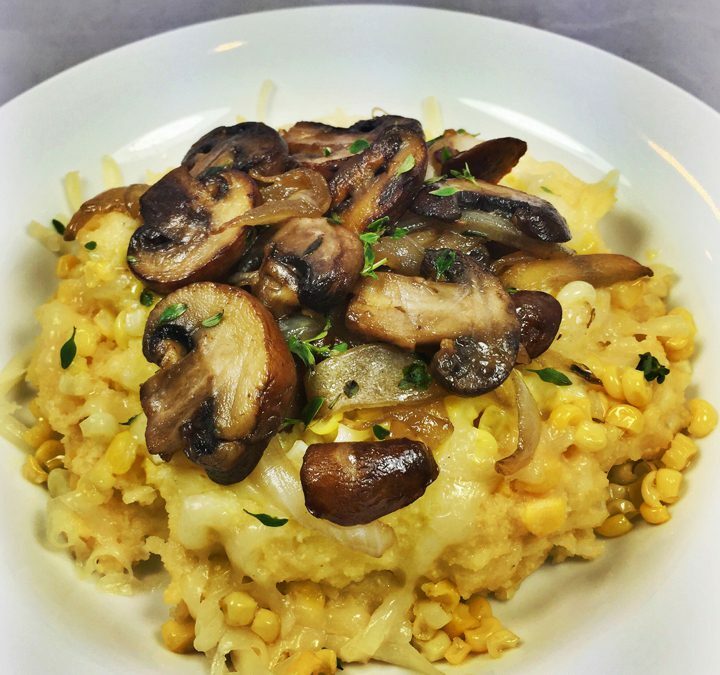 Potatoes can be cooked the day prior and refrigerated. Let come to room temperature before you grill. Heat a small sauté pan over medium low heat. Add the pepper pieces and cumin seeds. Heat until toasted on all sides and fragrant. Cool slightly and place in a spice blender. Add the smoked paprika, garlic powder, 2 tablespoons of kosher salt, and pepper in a spice grinder. Grind to a powder consistency. Wash the potatoes then slice any large ones into halves, set aside. In a large stockpot filled halfway with water, add 2 tablespoons of salt, and stir. Bring to a simmer over medium-high heat, add the potatoes, and cook until a small knife easily passes through the potatoes, about 10-12 minutes. Strain and transfer to a plate to cool to the touch. Pat the steak dry with paper towels, and brush with 1 tablespoon of olive oil on both sides. Rub with the spice mixture and place on a plate, uncovered, in the refrigerator for 30 minutes. Remove from the refrigerator. Place in a re-sealable or vacuum bag and pour the lime juice over the steak. If using a re-sealable bag, seal tightly, double bag, and refrigerate 8 hours, turning halfway through. If using a chamber vacuum, seal and refrigerate 2-4 hours. Heat a barbeque or stovetop grill to high heat. Remove the steak from the bag and pat dry with paper towel. Brush with olive oil and grill the steak for 3-4 minutes per side until rare/ medium rare (135-145 degrees) to medium (155 degrees). 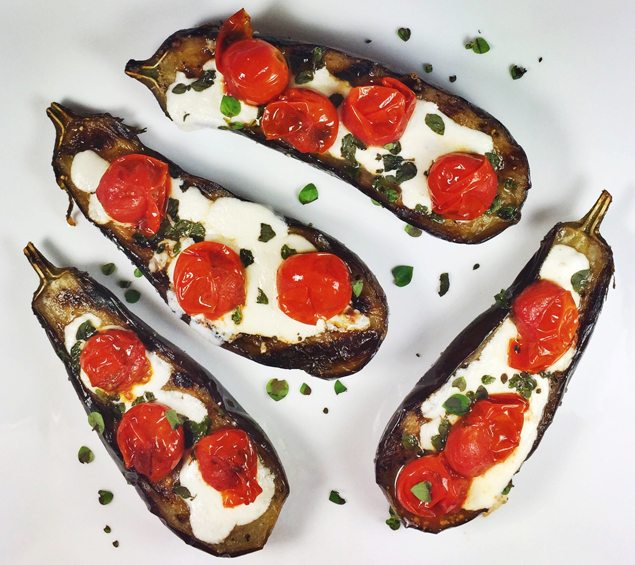 Remove from the grill, cover with foil, and set aside for 10-15 minutes before cutting. Place the cooked potatoes in a large bowl and gently toss the potatoes with 1 tablespoon oil and 1 teaspoon salt. Lay on the grill and cook until browning and well marked, turning halfway, about 5-8 minutes total, depending on the potatoes size. When finished, toss potatoes in a little more oil just to coat and salt to taste. Slice the steak and serve with the potatoes. Prep all ingredients the day before, store in separate containers, then mix together one hour before your dinner. Combine all the ingredients in a large bowl. Set aside for one hour before serving. If you don’t have a cold smoker, substitute with bibb lettuce leaves tossed in olive oil and salt. Place the lettuce in a bowl. Wrap tightly with cling wrap. Using a smoking gun, smoke with 1/4 teaspoon cherrywood chips. Seal tightly and leave in the bowl until the smoke dissipates, about 10-15 minutes. Separate the leaves and toss in a small amount of olive oil and salt. Can be prepared up to two days ahead. Store in an air-tight container. You can substitute white sugar for the bourbon smoked sugar, the pecans will just be missing a bourbon smoky flavor. Preheat the oven to 350°F. Line a baking sheet with a silicone baking mat or parchment. In a small saucepan, whisk the sugar and kosher salt. Add 2 tablespoons water and cook over medium heat until the sugar dissolves into liquid, and becomes very syrupy and thick, about 5 minutes. Fold in the pecans and stir until they are completely covered. Pour out on the baking sheet, spaced apart and divide into single nuts. Bake for 12 minutes, until the pecans are caramelized. Remove from the oven and slide the baking mat or parchment off of the hot baking sheet onto a cooling rack. Once completely cooled, break apart any nuts, if necessary, and store in an airtight container until needed. When finished, assemble all ingredients on plates. Makes six servings. So easy and tasty, the shrimp are prepared in just minutes either on the grill or in a grill pan. With a delicious kick, the Asian barbecue dipping sauce has fresh ginger and chili, perfect for taking the sweet grilled shrimp up a flavor notch. 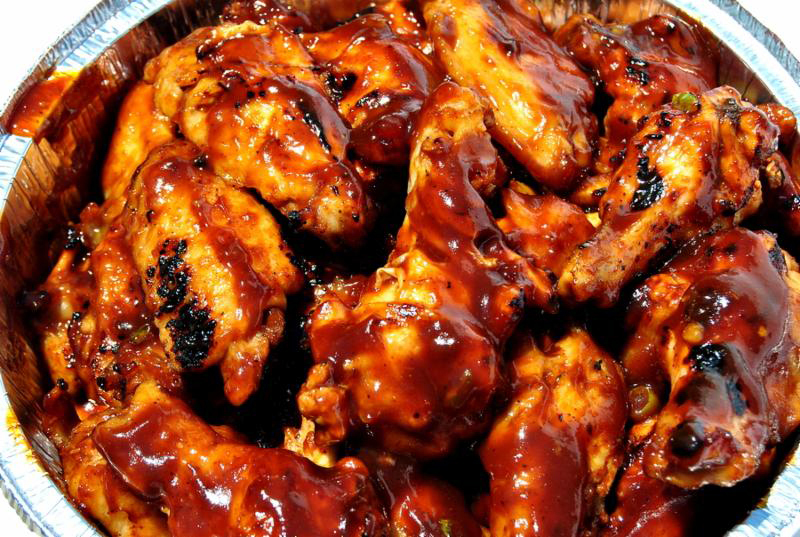 The sauce can be prepared the day prior, then simply bring to room temperature before serving. When using an outdoor grill, be sure to clean the grates just before using, and oil them lightly right before the shrimp goes on the grill to prevent them from sticking. Prepare an outdoor grill or heat a grill pan on the stove to medium-high. Heat 1 tablespoon of grape seed oil in a medium saucepan over medium heat. Add the garlic, ginger, Serrano chili, green onions, and the lime juice, sauté 3-4 minutes until the onions are soft. Add soy sauce, brown sugar, vinegar, and tomato paste; bring to a boil. Reduce the heat and cook over medium-low for ten minutes. Remove from the heat and cool the mixture slightly. Transfer to a blender; add the sesame oil, and process until thick puree forms. Return to a clean saucepan, cover, and keep warm. Toss the shrimp with the remaining tablespoon of oil, 2 large pinches of salt, and the garlic powder. Grill over medium-high heat for 2 minutes per side or until shrimp turns pink. 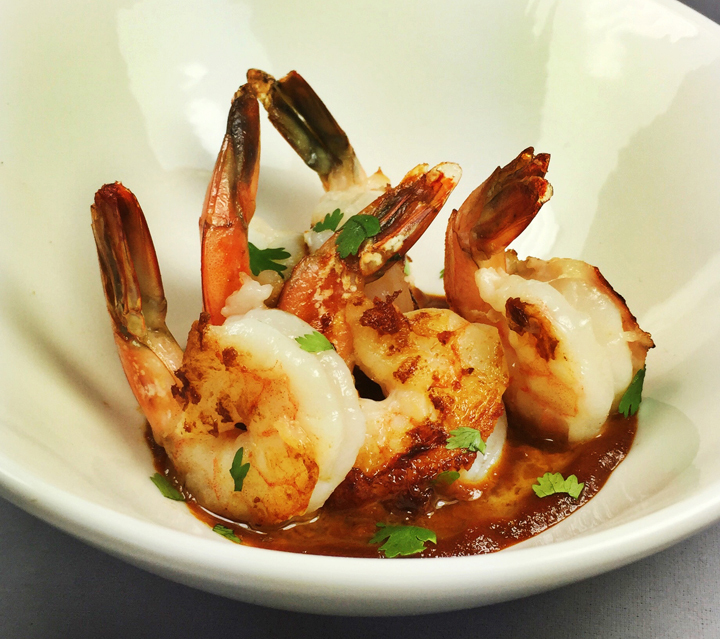 Serve the shrimp warm with the dipping sauce topped with the fresh cilantro leaves. Makes 4 servings.